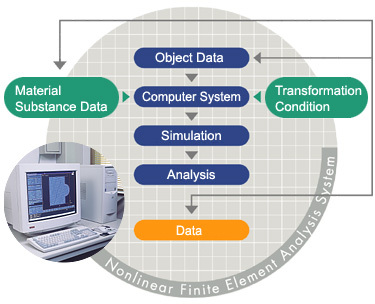 Inaba uses the Nonlinear Finite System (FEM Element Method) for the analysis and estimation of the resistance force variation affected by the design and material quality. Our main feature is carrying out computer simulation using 3D dimensional data to ensure the most precise layout planning speedily and also minimizing mistakes thus reduces overall costs. How do I decide the kind of material to be used after deciding on the design ? Next, how do I know if the design is good enough ? How can I employ the analysis data of the existing model for a new product design ? Cutting down time greatly for planning, designing and trial products ! Reducing costs for trial products ! Using a variation of simulation for the best solution ! (1) Estimation of shape changes caused by external force. (2) Estimation of changes of the rubber quality and hardness. (3) Estimation of the rubber internal stress and resistance force level. Please feel free to contact us for our analysis and consultation service.